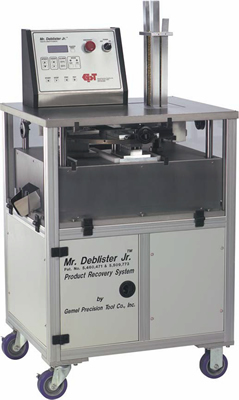 Mr. Deblister™, Mr. Deblister Jr-XL™ and Mr. Deblister Jr™ Product Recovery Systems are high speed deblister machines that safely separate and remove product, such as liquid gels, caplets, and tablets from blister cards, including walletized blister cards. The deblister machines are designed to be placed next to your thermoforming machine, so that rejects can be recovered during the lot run. Therefore, product in rejected cards can be repackaged without having to move the rejected product out of the packaging area, and before the next lot would reach the machine. The system recovers push through, cold form and child resistant blister cards and has no difficulty with tight product blisters or stiffening ribs. The ease of operation requires only 1/2 hour of training. Mr. Deblister™ processes up 4800 cards per hour. Tooling changeover needs only 10 - 15 minutes. The change parts include: twelve nest plates, one magazine and one set each of custom perforation and push out tooling (varies according to card layout and products). Mr. Deblister Jr™ and Mr. Deblister Jr-XL™ processes up to 3000 cards per hour. Tooling changeover needs only 3 - 5 minutes. The change parts include four nest plates, one magazine and one set each of custom perforation and push out tooling (varies according to card layout and products). Required Floor Space 24" x 48" 30" x 36" 23" x 28"